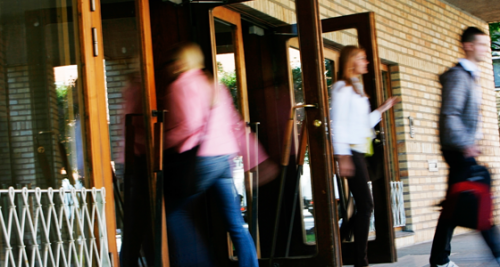 You can study economics and business administration on the university level in ten different universities: In Helsinki, Jyväskylä, Joensuu, Kuopio, Lappeenranta, Turku, Oulu and Vaasa. In addition to this University of Turku has a campus in Pori, Hanken in Vaasa and Aalto Business School in Mikkeli. You can find all the different universities with business studies here. You can study in Finish in eight universities and in Swedish in two. In addition you can study your degree in part or in whole in all ten of them. It is important to note, that there are also non-university higher education institutions teaching business in Finland. There is a dual model in higher education in Finland. This means that there are universities, and then there are polytechnics, or universities of applied sciences (UASs). Universities are more geared towards research and theoretical education, while UASs are more practice oriented. More information about the higher education system can be found from the website of the Ministry of Education and Culture. University level business degrees are the Bachelor of Economics and Business Administration, Master of Economics and Business Administration and Doctor of Economics and Business Administration. The bachelor degree lasts three years and the master two years. Completing a doctoral degree normally takes about four years. 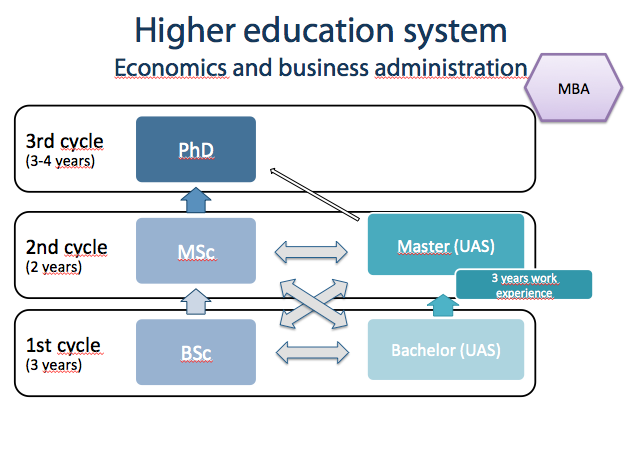 Most degrees in Finland follow the framework of the European Higher Education Area, where the first cycle degree is the bachelor, the second cycle the masters and the third cycle is the doctorate. In Finland the first and second cycle degrees can be obtained from both universities and UASes, while the doctorate is only available in universities. Following the framework of qualifications, the bachelor’s and master’s degrees are in principle on the same level, although the content varies. Even though the studies are split in bachelors and masters, in universities most students continue straight to the master’s level after completing the bachelor. However in UASes this is different, because to be able to continue to the master’s level, the students need to have a minimum of three years of work experience. So one of the defining differences between the universities and UASes is, in addition to the theoretical vs. applied orientation of studies, that in universities students mostly graduate with a master’s, while from UASes students graduate with a bachelor’s degree. As explained, students are admitted in most cases to both the bachelor’s and master’s degrees. This means that after they graduate from the bachelor programme, they can continue straight to the master’s level in the same university without additional entrance exams. The only exception to this is the Mikkeli Campus of Aalto University, where the students are admitted only to Bachelor’s programme after which they go to the labour market, or apply to some university to do their master’s. When students graduate from secondary education (gymnasium or similar), they apply to university on the bachelor level. The master’s level admissions are for applicants who have already graduated as bachelors or masters from some higher education institution in Finland or abroad. For international students, the student admissions vary between universities and more information on the specificities of the admission process can be found from the websites of the different universities. For Finish speakers, most universities, apart from Universities of Jyväskylä and Åbo Akademi and Hanken, are part of the joint application system. This means that applicants can apply with one application form and take one exam, which is then the basis for their assessment. The application period for the joint application system is 4.3-3.4.2013 and the exam is held on Tue 11.6.2013. The website for the Joint application system is here. There you can find information about the process, timetables, exam material and other information related to the application process. Hanken, Åbo Akademi and University of Jyväskylä has different selection criteria, which can be found from their respective websites. Some universities use also other criteria in place of the joint entrance exam, or to compliment that. Examples of these are SAT test, interviews, motivation letters, work experience etc. Master’s level application period and criteria vary quite a bit between universities, and also between different master’s programmes. This means that the applicant must be careful not to miss some important deadline or piece of information. For example the application period for the master’s programmes in Aalto University is 2nd of Jan to 15th of Feb, while the period for Hanken is 21st of Jan to 1st of March. Where the applicants for the bachelor’s programmes normally apply to a single programme and specialize only after one year of studies, in the master’s level this is different. On master’s level the application is often directed to a specific programme and so the criteria are also different for almost all programmes. This means that applicants need to get acquainted with the different programmes and their criteria. This might sound like a lot of work, but the different programmes are described fairly well on the websites of the universities and once you have identified the programmes that you are interested in, it is already much easier to compare them. If you are interested in studying economics and business administration in Finland go a get acquainted with the programmes of the different universities and their student selection criteria. The website of the Association of Business School Graduates, SEFE, offers more information about the studies themselves and the labour market opportunities during and after graduation.